This must have happened in 1994 or 1995. Jeff and our two younger sons and I went to the souq one evening. I don't think we were even planning on buying anything. It was just something to do on a warm evening, to get out of the gilded cage where we lived. The main souq in downtown Jeddah is a lot of fun to wander around. You can find everything there from very fresh fish from the Red Sea to antique silver jewelry from Yemen, from crock-pots to pirated movies, from scarves to toys, from flat-bread wrapped around lamb shawarma to flat-bread wrapped around fava beans ("foul," pronounced "fool," incredibly delicious) and flavored with a little harissa (spicy red sauce, also incredibly delicious). Before I tell about that evening, I want to tell about an experience I had with my older daughter one morning in the souq. We had gone into a notions store to find thread, and there a very small and very beautiful Saudi woman struck up a conversation with us. She'd been raised in a diplomatic family, so she'd lived all over the world, and she spoke English perfectly, and, of course, Arabic, and at least two other languages. She helped us find what we were looking for, bargained with the shopkeeper for us, and then walked around the souq with us, helping us figure out how things worked. And then she stayed in contact with us, helped my daughter get a job, and invited us to weddings and other social occasions, and helped us enjoy our time in the country. So, I like to keep her in mind, and all the many other Saudi people I met over there who were kind and thoughtful and more "Christian" than a lot of us self-proclaimed followers of Christ are, when I start to remember the one or two less-pleasant things that happened to us over there. Also, I need to mention that even that night when we got home we had to laugh at the ridiculous situation we'd been in that evening. (For example: "Mom, you should have seen your face when Dad walked away!") And it has seemed even funnier over the years. Okay, so, here's the story. We'd been in the souq for only about 15 minutes when the call to prayer came. Faithful Muslims pray five times a day, and one of those times is in the early evening. The musical call went out over the loudspeakers throughout the souq, and the faithful men streamed into the nearby mosque to pray. For those less faithful, mostly teenagers and young men, a mutawa went around with a riding crop, trying to herd them into the mosque. The women waited patiently outdoors, because those public mosques were really only for men. We also waited patiently, leaning against a rock wall in the shade of a big tree. Suddenly we realized that all the women were staring at us, and that the young men weren't running toward the mosque any more. Then we saw a man with ultra-religious facial hair and clothing, with a policeman on each side of him, coming toward us. "Good evening," said the mutawa, because that's what the man in the middle was, a religious policeman. "I'm speaking English to you," said the mutawa, "because I can see that you're American, and I don't care if you speak Arabic. I'm speaking English to you, to tell you to tell your wife to cover her head." "My wife doesn't have to cover her head," Jeff said. "The American Consulate has informed us that if we are Christians, and if we dress modestly, we are not required to adhere to Muslim religious customs." "I don't care what the American Consulate says," said the mutawa. "You are in my country, and your wife must dress respectfully. Tell her to cover her head." Jeff said, "I won't tell her that. She's an adult and she's an American, and she's my equal. I don't tell her what to do or what to wear. She can wear whatever she likes. If you want to tell her something, you can tell her yourself." "I will not speak to her. She is a woman. That is why I am telling you to tell her to cover her head." "I won't tell her that," said Jeff, and he walked away and disappeared on the other side of the courtyard. The mutawa turned to me and said, "Cover your head." I said, "I thought you weren't going to speak to me." "I must speak to you because your husband is not here. Cover your head." "I won't. I don't have to. I am dressed modestly, and I am not a Muslim, and I don't believe I have to cover my head." "Then my two friends here" --- he motioned to the cops on either side of him, who looked like they wished they had shovels so they could dig very deep holes and crawl in them --- "will arrest you." "I don't think they can do that," I said. "With my husband's job we have a kind of passport that if you have me arrested the police will be very embarrassed. Plus someone will come immediately and get me out of jail." "I don't care," said the mutawa. "I myself will not be embarrassed. I think rather that your government will be embarrassed, and you will have to leave the country, and then what about your husband's job? And, since your husband is not here, what will happen to your two sons?" I knew my husband wouldn't lose his job, but I was sure the mutawa was right about someone in the hierarchy of his work being very embarrassed, and so I said, "Well, but, I don't have anything to cover my head with." "Then you must promise me that as soon as prayer time is over and the shops are open you will buy a scarf and cover your head." "No, I won't do that. I have plenty of scarves at home, and I'm not going to buy another one just for you." "Then I will have my friends arrest you right now." "Okay, then," I said. I untied the abaya from around my neck. The mutawa and the two cops jumped back like they thought I was going to take off all my clothes or something. But I just pulled the abaya up over my head and re-tied it so my hair was covered. "Very well," said the mutawa, and he motioned to the cops to follow him as he walked away. My sons, who had stood on either side of me through this whole incident, sighed with relief. The women in the souq, who had been watching intensely from behind their veils, turned away and stopped staring. Men started coming out of the mosque. As soon as the mutawa's back was turned, I untied the abaya and pulled it down so it was around my shoulders again and re-tied it. My sons tensed up again. But I knew the mutawa would not risk losing face by turning around. And my husband walked back across the plaza from wherever he had been waiting. The four of us tottered back to our car, a few blocks away. "Why did you go away and leave me to deal with that by myself?" I asked, as soon as I could speak again. "What do you mean? Why wouldn't I? I knew you could handle it," he said. 2014: Please note that there still are and will be still more training posts, but most of them on another blog. Check it out! And I get it. 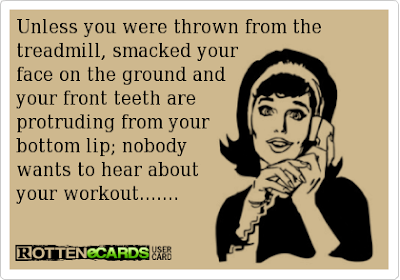 I don't usually want to hear the details of other people's workouts, either, any more than I want to hear about how they studied for a physics exam or had some blood drawn or whatever. That's why I don't often write about my fascinating (to me) workouts or spin classes. But lots of times we learn from other people's experiences, so I'm reading stuff I wouldn't have thought of reading in the past (for example, how Lance Armstrong used to train for the Tour de France, even though he's no longer my "hero"). With this in mind, I thought other people might be inspired, like I was, by the stories of some remarkable women in the early-morning spin class I take at my local 24-Hour Fitness Center. See the photo of the smiling lady on the bike? That's Carole, who's among the 25 to 30 regulars in Derek's 5:30 am class every Monday, Wednesday, and Friday. 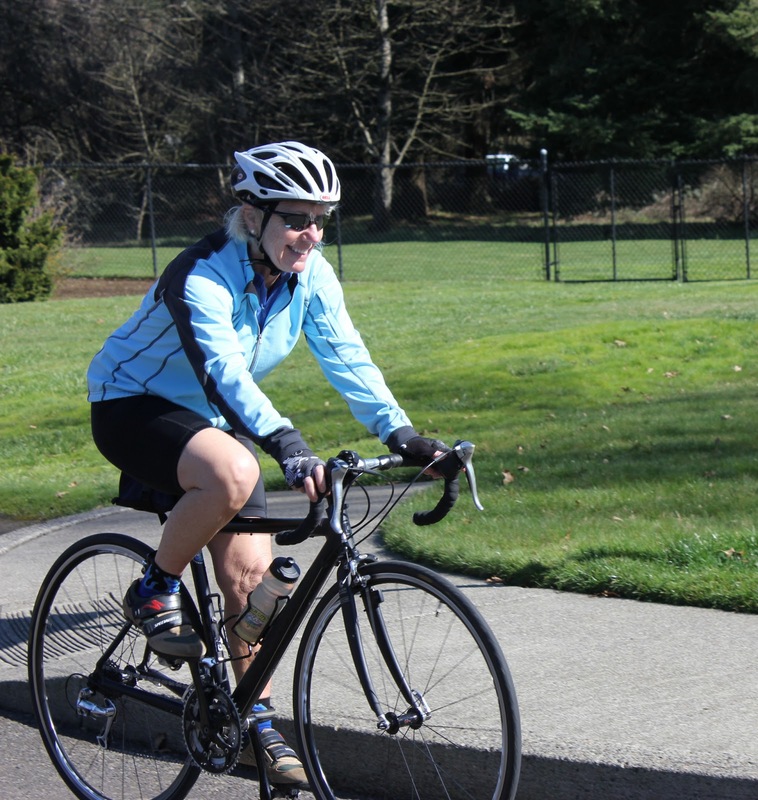 I thought about this story when I heard what Carole and some of the other class members are training for: the STP (Seattle to Portland) two-day bike ride coming up in July. So I emailed my friend and journalism mentor Dean Baker, who writes for the Oregonian's Clark County weekend section, to see if he would be interested in writing about it. He replied, "I'm in Hawaii. Go ahead and pitch the story yourself. You can do it!" So I did it, and the editor took the pitch, and I wrote this story, which also appeared in print. 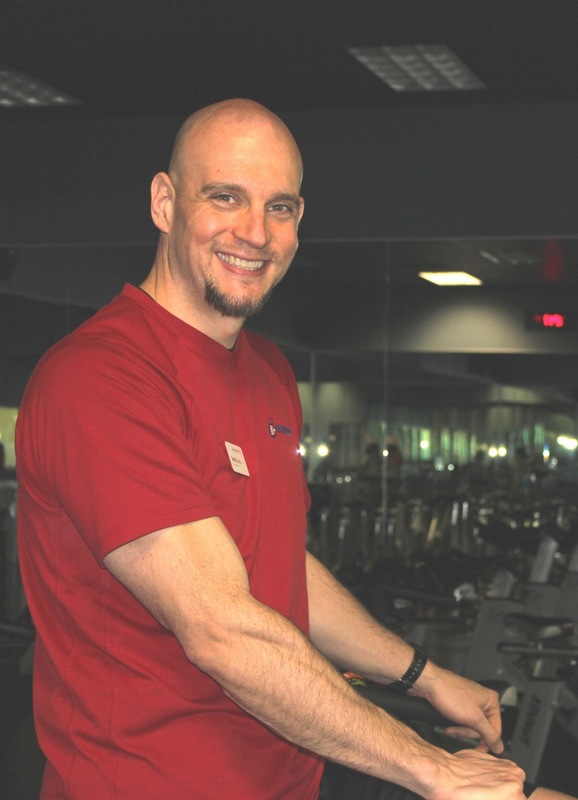 To do it, I interviewed Carole and Darla from the class, people from the Vancouver Bicycle Club, some Clark County bike shop and fitness club owners, and Derek and his wife Christie, who are both cycling instructors and personal trainers. I had to switch the focus of the story from the STP to the less famous Ride Around Clark County (RACC) because STP registration was full and anyway Clark County is the focus of these stories. Meanwhile, Carole kindly took me on some bike rides around Camas and Vancouver, our own Mini-Rides Around Clark County, helping me get more comfortable on my new bike with the pedals that you clip your shoes into and showing me how to be comfortable on the road. Of course I'm still training hard once or twice each week with Derek, in addition to the 5:30 cycling classes and boot camp classes two or three days a week and yoga and Pilates and swimming laps whenever I can stand to. Here's one of the photos I sent the Oregonian but which they didn't use, and I don't know why. Because, if you're choosing a personal trainer, isn't this the kind of person you're looking for? It's not just the guns, it's the "You can do anything" attitude, the "Are we having fun yet?" smile, the ability to push his clients farther than they would ever push themselves until they figure out how to keep going even when they really really really want to give up. This is what I'm learning: Yes, I can do it, and here's how I'm going to do it. So my training for the Huntsman* 140 is continuing in many different ways, not just physically but also mentally. Not that I'm there yet. I'm definitely still learning, still trying, still figuring things out, still preparing. Part of the preparation will be riding in the Ride Around Clark County and Reach the Beach, both in May, so I can experience a couple of races/rides before that big one in Utah in June, so I can get used to riding with a bunch of other people in a big ride, and because I've got to get in the miles on the road, too. Oh, yeah, and Jeff is going to help me ride my bike at an elevation higher than our1,000 feet above sea level every chance we get between now and then. So far this year the only tennis I've played has been hitting tennis balls against the wall at the tennis courts at Grass Valley Park, to warm up my arm and shoulder, and then practicing my serve. It's good exercise and good practice, but of course tennis is meant to be played against an opponent, and I haven't found anyone who (a) wants to play and (b) has knees that aren't on the verge of breaking down. But today I ran into a really cute guy who promised me he will be there tomorrow at the same time if the weather is nice, and he'll play tennis with me if I'll bring another racket. So I'll be there tomorrow with an extra racket. Oh, did I mention this guy is about 8 years old? And I also promised to play kickball with him for part of the time? Because that's how we met: He was kicking his kickball against the wall outside the tennis courts while I was hitting tennis balls against the wall inside the courts. I hit a couple of balls out, and he picked them up and threw them over the fence to me. I said, "Thanks. Good arm, good throw." He said, "Thanks, you're good at tennis. I said, "You're good at kickball." He said, "How did you know it's kickball?" He said, "If you have another racket, I'll play tennis with you." I said, "Sorry, I didn't bring another racket, but I'll keep one in my car in case I see you here again sometime." He said, "The ladies said we'll come tomorrow if the weather is nice. Do you want to play kickball with me?" I said I had to leave in a couple of minutes (which was true) but promised to play kickball as well as tennis tomorrow. And so we arranged a play date. I don't think the ladies who brought him (and about 10 other kids) there in the van from the after-school day care center will mind. "The trouble with quotes on the internet is that it's difficult to determine whether or not they're genuine." Yeah, that's always bothered me, too, Abe. But I *know* you didn't really write this quote because you would have known that you should always capitalize "Internet." I recently heard this piece for the first time in a poetry workshop. 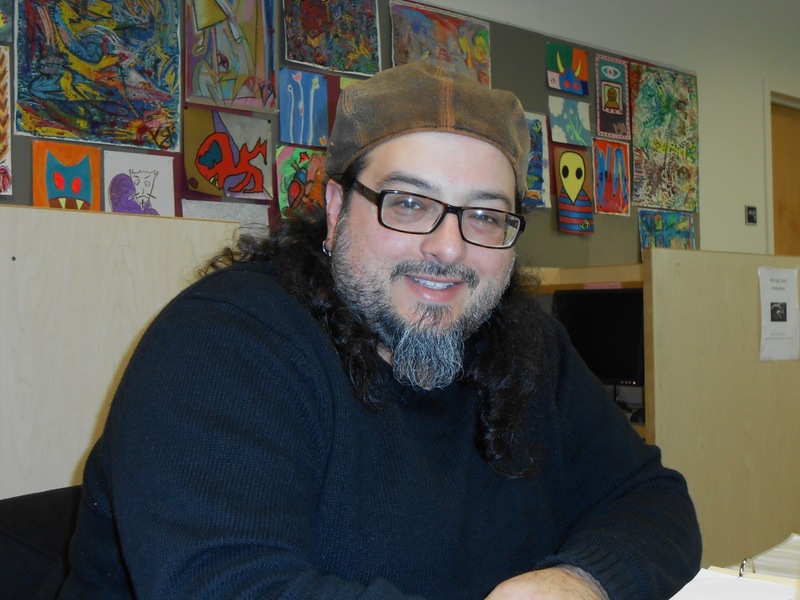 Yes, a poetry workshop, led by Clark County's very first Poet Laureate, Christopher Luna. He holds these workshops one Saturday every month, then offers free workshops at the Washington State University Vancouver Writing Center every Tuesday, too. And even if only one person shows up, he holds the workshop. I know this because it has happened with me a couple of times. I think I wrote recently about real poetry and real poets. Oh, wait, that was my evil twin sister, Madame L, Poetry's Number 1 Fan. Madame L wrote, "Madame L spent an amazing afternoon yesterday talking to a REAL poet, and she will write more about that experience, and him, sometime soon." So, here it is: Christopher Luna and I sat in a cafe listening to a recording of John Coltrane's "Resolution" and wrote down whatever we felt like writing. I wrote a poem called "Resolution," about the way the chords and arpeggios in that piece interweave in a pattern of conflict followed by resolution. The poem isn't finished yet --- in fact, it's a mess --- so I'm not including it here. But eventually I'll figure out where I was going with it and bring it to resolution, and then I'll put it here or somewhere. Meanwhile, I'm wondering if, when you listen to the song, you get the same sense of resolution. I didn't know that until later. I wonder if knowing it would have changed the way I listened to the music. I wonder if changing the way I listened to the music would have changed what I wrote. How does this stuff work, anyway? I don't know, but I (or Madame L) will be writing again soon about Christopher Luna and real poetry and real poets. "The album is, in many ways, a reaffirmation of faith. And the suite lays out what you might call its four phases: "Acknowledgement," "Resolution," "Pursuance" and "Psalms." A Love Supreme has even spawned something of a religious sect. Reverend Franzo Wayne King is pastor of the Saint John Coltrane African Orthodox Church in San Francisco. The congregation mixes African Orthodox liturgy with Coltrane's quotes and a heavy dose of his music. Pastor King calls the album the cornerstone of his 200-member church. "While it's unknown whether Coltrane would have wanted to be worshiped or have his art deified, it's clear in every way that he saw A Love Supreme as much more than just another recording." I found the link to this article (titled "Arrests and forceful deportation of expatriates by Saudi Arabian government – Explained") on the Facebook page of a friend who lives in Saudi Arabia right now. Everyone knows that the newspaper reporting on the situation, the Saudi Gazette, is a mouthpiece of the government. It "explains" what the various government ministers quoted in the article want it to "explain." If it doesn't "explain" things well enough, it won't be reporting on anything any more. Here's what is happening: The Labor Ministry is responsible for enforcing labor rules for expats. One of these rules forbids a spouse of a legally employed expatriate worker to be employed. So when a company based in some other country or a private school offers a wife a job, promises to pay her under the table, and ignores the fact that she doesn't have an iqama (a work/residence permit, pronounced "e-gama"), she'll usually jump on it. The Saudi Gazette is explaining that all those rumors about people's iqamas being taken from them or torn up in front of them as they're being hauled off to jail simply aren't true. That's because some guy in some ministry office told them so. Anonymously, so he could keep his job. And nobody in the whole history of the Saudi government has ever told a lie, am I right? Can you give me a YES! "Meanwhile, a number of private schools across the Kingdom announced holidays on one pretext or the other as many teachers and drivers are not under the sponsorship of schools where they work. A private school teacher said that the fear of being caught and deported has stopped them from going to work. 'We regret to inform that because of a major electrical maintenance work, the school will remain closed until further notice.' This was a common text message sent by many of the private schools to the guardians of students. Some private schools assured their staff of all protection while others told the teaching and non-teaching staff not to report for work. A popular private school in Jeddah reportedly bundled out its teaching staff through the back door when the school guard triggered panic about an impending raid. Principals of some of the private schools told Saudi Gazette that they had to close schools because the pre-school teachers who are under their husbands’ sponsorships did not report for work fearing punitive action by the Labor Ministry. Indian Embassy schools are reopening Monday after a two-week break." Are the officials of these embassies and schools at all worried about what may happen when they re-open and the teachers still don't show, or the teachers do show and are arrested? Not at all. They wouldn't dare. They don't make these any more, and if they did, truth to tell, I wouldn't buy one. And I certainly would never buy one of the vintage cars that people are restoring and selling. Again, they may be beautiful, but they're not what I'm looking for in life. So, even if I had that much money, I could think of about 20 different ways to spend it that would not include buying any kind of car. Right now, my dream car is the one I drive, which is 13 years old and has more than 160,000 miles on it.